Jane Seymour helped kick off the summer season with her collection of original watercolor and oil paintings, as well as limited edition artwork. The exhibition was displayed over Memorial Day Weekend at Ocean Galleries. The multi Emmy and Golden Globe winner, most recently seen by millions on the popular television show “Dancing with the Stars,” has proven her artistic talents on the Broadway stage, motion pictures, and television, yet it is her love of art and color that has inspired her to follow her passion into painting. Often described as a California colorist, Jane was inspired by Matisse’s stunning motifs and Chagall’s magical palette. Jane’s artwork ranges from colorful flower arrangements, detailed landscapes, and lush gardens, to intricate beach and landscapes, to wistful figurative paintings, all inspired by her travels and life experiences. Ms. Seymour has exhibited in numerous galleries and venues across the nation and has accepted select private commissions. She was chosen as the official artist for the Naples Winter Wine Festival 2006 and was one of the painters selected to represent the U.S. Team in the 2006 Winter Olympics held in Torino, Italy, as well as the upcoming Beijing 2008 Summer Olympics. Jane believes that “the best gift you can give to someone is a part of your soul,” as she does in her beautiful and expressive artwork. This exceptional exhibition included a broad survey of artworks and artists to fully illuminate the principles of the Impressionist movement. A viable form of visual expression for the past 150 years, Impressionism is one of the most popular and beloved art forms. The survey began with the artists who pioneered Impressionism and changed the course of western art history, featuring original lithographs, etchings, and drypoints from some of the greatest Impressionists including Edouard Manet, Jean-Francois Raffaelli, and James Whistler. One of the most well-known leaders in the development of the Impressionist style is Pierre-Auguste Renoir whose original etchings, lithographs, bronzes, and oils were part of this extraordinary show. In addition, his great-grandson, Alexandre Renoir, was on hand at the show with his own original oil paintings. 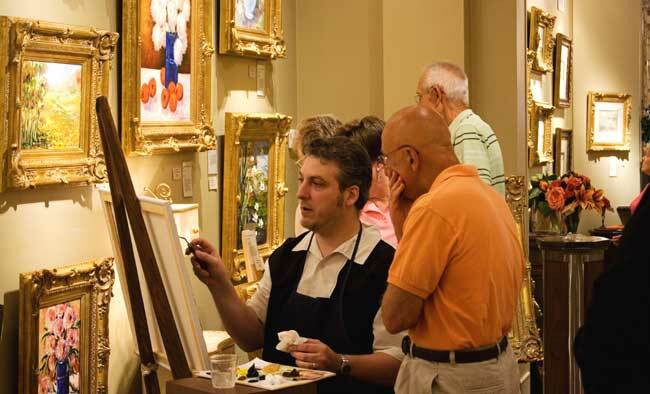 Guest had a rare opportunity to watch Alexandre as he painted amazing new oils during the exhibition. The exhibition also featured numerous pieces from the Pissarro family, who have a long history of producing famous Impressionist artists. The first family artist was Camille Pissarro, nicknamed “the father of impressionism” because his work directly led to the development of the movement. Besides being the figurative father of the movement, he was also the biological father of Paulemile and Manzana Pissarro, both of whom became prolific Impressionist artists in their own right, along with Paulemile’s son, H. Claude Pissarro. There was also original limited edition lithographs by the contemporary artist Lelia Pissarro, who is the great-granddaughter of Camille Pissarro. Alexandre Renoir demonstrates his Impressionistic painting technique for visitors to the exhibition. Peter Max, one of the gallery’s most requested artists, was back for the summer of 2008! Max exhibited new original paintings done especially for this show along with the iconic imagery that has made him a world-renowned legend. Peter Max and his vibrant colors have become part of the fabric of contemporary culture. He has been successively called a Pop Icon, Neo Fauvist, Abstract Expressionist and the United State’s “Painter Laureate.” His paintings have been on exhibition in hundreds of museums and galleries worldwide. Max has achieved his place in history having painted for various Heads of State, including six U.S. Presidents. His art appeared on the first U.S. 10-cent stamp bearing the title “Preserve the Environment,” and 235 U.S. Border murals greeting millions of people entering America each year. America’s preeminent Pop artist was the official artist for the 2006 U.S. Olympic Team. His art appears on a Boeing 777 jumbo jet currently flying the skies for Continental; a 600-foot stage for the Woodstock Music Festival; and many other iconic settings. Max has also been designated Official Artist of five Super Bowls, six Grammy Awards, the World Cup USA, The World Series, the United Nations Earth Summit, and numerous other events. Most recently, he has become an art correspondent for “The Early Show” (CBS). Howard Behrens, America’s foremost palette-knife artist and one of the most-collected artists of our generation, chose Ocean Galleries to hold his final gallery show. This once in a lifetime show featured a retrospect of his contemporary, Impressionistic artwork with paintings from his college years to his very first palette-knife painting and all the way through his amazing career. Using only a palette knife, Behrens paints with great dramatic intensity and focus. His paintings, distinctly textured and brilliantly illuminated land and seascapes, evoke memories of romantic interludes in exotic settings, often encompassing familiar architecture and promenades. Classically trained, Behrens developed his current painting style from his lifelong passion for travel, particularly to beautiful coastal regions.